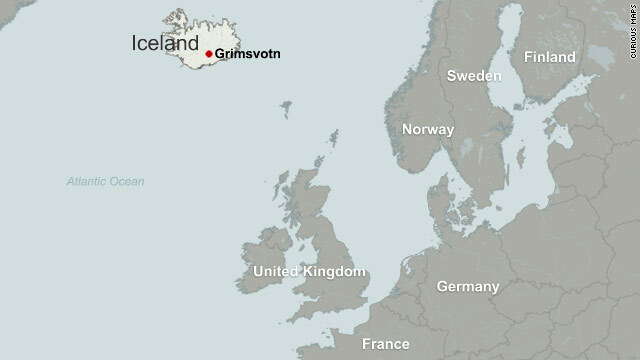 London (CNN) -- A cloud of ash from Iceland's Grimsvotn volcano spread toward central Europe late Tuesday, spurring German authorities to announce two airports will close and prompting British airlines to cancel hundreds of flights. Hamburg International Airport will shut down at 6 a.m. Wednesday (midnight Tuesday ET), while Bremen's airport will close at 5 a.m., Germany's Aviation Safety Agency announced. 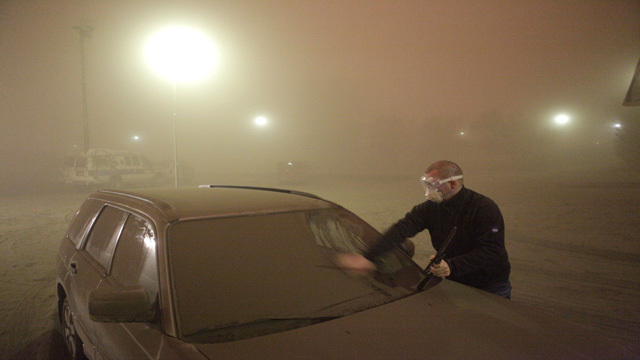 Berlin's airport could be affected by the falling ash by noon Wednesday, the agency said. A portion of the ash from Saturday's eruption in Iceland had spread over Britain by Tuesday afternoon, with the cloud reaching London's Heathrow airport -- the world's busiest international air travel hub -- around lunchtime, a computer model indicated. The European air traffic control organization Eurocontrol reported about 500 flights in British airspace were canceled Tuesday, roughly double the number expected earlier in the day. The ash cloud was projected to cover all of British airspace by early Wednesday morning and will be densest over Scotland, Northern Ireland and northern England, according to Britain's weather agency, the Met Office. But British Airways, which sent a test flight into the region Tuesday evening, said it expects service to return to normal by Wednesday. That may help passengers like Karen Bryan, who was unable to return to the Scottish city of Edinburgh from the Mediterranean island of Malta on Tuesday. "It's bad not knowing what's happening, being on standby and not knowing when and if you'll get back," Bryan said. The number of flights affected was a small proportion of the 29,000 or so that had been expected across the continent, Eurocontrol noted. But Germany's meteorological agency projected that the cloud would spread across the country's north and could reach Berlin around midnight Tuesday, raising the possibility of more cancellations. And there was a "strong possibility" it could also affect Denmark and parts of Scandinavia by the end of the day, Eurocontrol reported. The Grimsvotn eruption came about 13 months after Iceland's Eyjafjallajokull volcano belched smoke and ash into the skies over the continent, forcing the cancellation of thousands of flights per day at the peak of the problem. 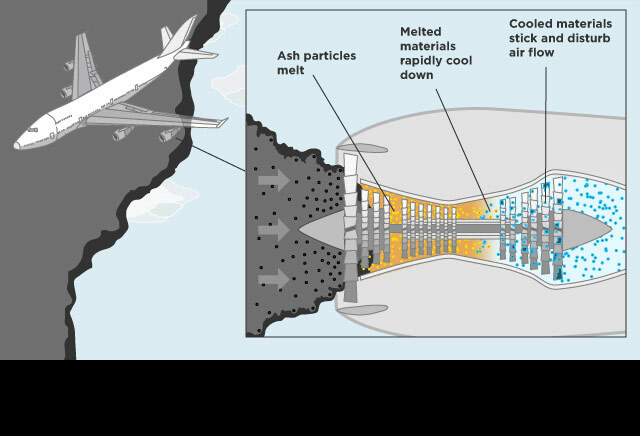 The ash can be a serious hazard to aircraft, reducing visibility, damaging flight controls and ultimately causing jet engines to fail. Grimsvotn's eruption was more than 10 times larger and put more ash into the air in 36 hours than last year's burst did in a month, University of Iceland geophysicist Magnus Tumi Gudmundsson told CNN -- but the main eruption is now over, he said. "We expect it to behave and slowly decline," Gudmundsson told CNN. "It will, however, last for several more days. The ash does continue to cause huge problems on the ground, but no new ash is coming into the high altitudes." Gillian Foulger, a geophysicist at Britain's Durham University, told CNN that the disruptions from the larger eruption are likely to be smaller than they were in 2010. Most of the ash is blowing northwest, toward sparsely populated Greenland, and the European aviation industry collected valuable safety data during last year's event. "It's much better able to set the safety thresholds accurately, so I think things are probably going to turn out very well for us," Foulger said. Airlines have been making the case that it is safe to fly through ash clouds of medium density, Britain's Civil Aviation Authority said Tuesday. Carriers including British Airways, Virgin and EasyJet are now free to fly through clouds of up to 4,000 micrograms per cubic meter if they feel it is safe to do so, Richard Taylor of the CAA told CNN. The budget airline Ryanair, one of Europe's biggest carriers, announced that it had canceled its remaining flights from Scottish airports Tuesday after arguing against closures. The airline said it had conducted a test flight that found no ash, but Taylor told CNN that Ryanair's claims were "not true" and that the test flight did not go where the airline claimed. British Airways canceled all flights to and from Edinburgh and Glasgow in Scotland and Newcastle in northern England until at least 7 p.m. Tuesday, though service to Aberdeen, Scotland, continued. Dutch airline KLM also canceled dozens of scheduled Tuesday flights to and from locations in Scotland. And British Midlands International canceled its Tuesday evening flights into Glasgow and Edinburgh but resumed service to Aberdeen, the carrier announced. U.S. President Barack Obama left Ireland for England on Monday, a day earlier than planned, to make sure the ash cloud would not affect his flight plan. Barcelona's soccer team also announced on Twitter that it would fly early to London for its Saturday match against Manchester United in the Champions League Final. The ash forced the closure of Icelandic airspace over the weekend, but the island nation's main airports were open Tuesday. Flights to London were canceled, but flights to North America and Scandinavia were still scheduled. Britain's CAA said new arrangements have been put in place since last year's eruption, and those changes should reduce the number of flights that have to be canceled if the ash cloud spreads. Grimsvotn lies beneath Iceland's Vatnajokull glacier, a sheet of ice more than three times the size of the U.S. state of Rhode Island -- larger than any on mainland Europe. It is the country's most active volcano and last erupted in 2004, according to the Icelandic Meteorological Office. In 1783, a 16.7-mile fissure system from the volcano produced the world's largest known historical lava flow over a seven-month period, damaging crops and livestock, according to the Smithsonian National Museum of Natural History. A resulting famine resulted in the loss of one-fifth of Iceland's population, according to the museum. CNN's Ayesha Durgahee, Adam Reiss, Claudia Rebaza, James Partington and Brianna Keilar contributed to this report.